Get rid of dry sensitive skin with an in-depth nutri-reconstituting cream from La Roche Posay. The highly effective Nutritic Intense cream is a paraben free formula which increases suppleness in the skin. Working with new INNOVATION MP- lipids, this formulation works to soothe the painful symptoms associated with dry/very dry skin so you don’t have any more tightness, stinging or tingling. 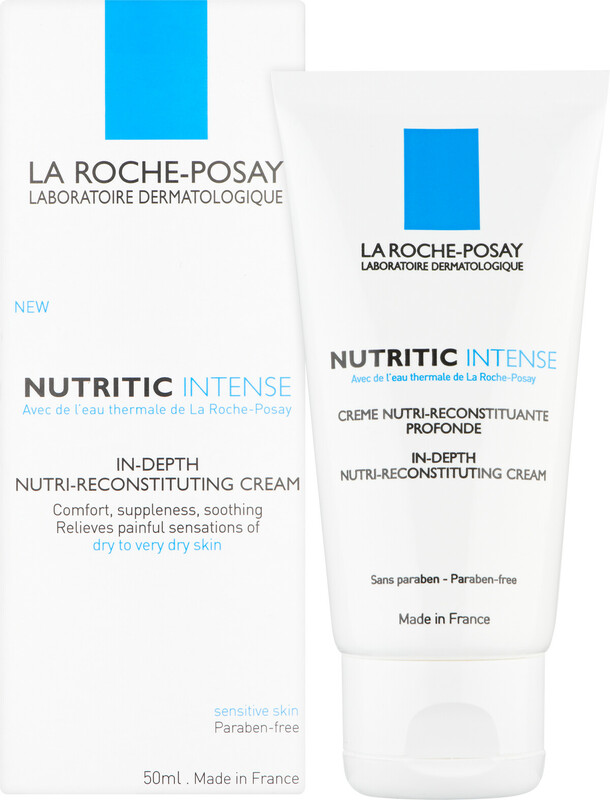 La Roche-Posay Nutritic Intense 50ml is rated 4.8 out of 5 by 5. Rated 5 out of 5 by Seasidegirls from Perfect cream for cold weather and sensitive skin I use a lot of different La Roche posay products depending on summer or winter and my annoying rosacea. It’s just turning cold and my cheeks and chin turn red - very attractive, so I need to step up my creams. This is a new purchase for me and I am using it as a night cream. It really seems to moisturise my skin and it’s this that will control my redness. Without doubt - and many, many different cream purchases - the best cream when my rosacea flares is Avene anti rougeurs fort. I apply it as soon as I wake, again after cleansing with toleraine cream cleanser and during the day if I face burning. Best product ever and goodness knows, I’ve tried so, so many. Best prices ever at 1/3 off French pharmacy time! Rated 5 out of 5 by MaddieMoo from lovely face cream I like to use this in the evening before bed. It is deeply nourishing without being greasy. I have normal skin,(age 58) not particularly sensitive but I like to use gentle yet effective products and this ticks all the boxes. Rated 5 out of 5 by Westgirl from Wonderful at night I love to use this after I have taken all my make-up off. My skin feels fabulously hydrated and dewy all night. I use Hydreane in the mornings. You can't get better even at 10 times the price. Rated 5 out of 5 by MagdalenaD from Very good cream for dry skin I have very dry skin and this cream is excellent. No irritation, very gentle and does the job. For dry skin this cream is perfect especially during winter.